On the fourth floor of the Ronald Tutor Campus Center, a 9,000-square-foot studio bustles with energy as students cluster around work stations stocked with power tools and 3D printers. 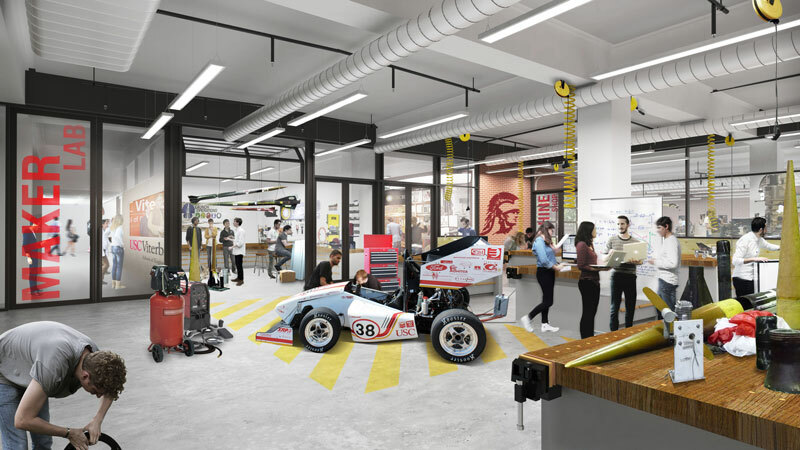 Known as “The Garage,” the dynamic makerspace was designed for students at the USC Iovine and Young Academy for Arts, Technology and the Business of Innovation. 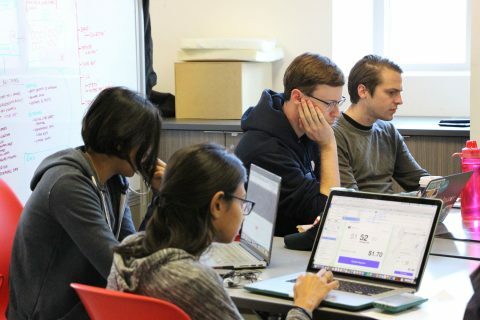 “We believe in a make-fail-learn-iterate approach to ideation, and makerspaces facilitate that through rapid rendering of early-to-late stage prototypes,” says Erica Muhl, dean of the USC Iovine and Young Academy. 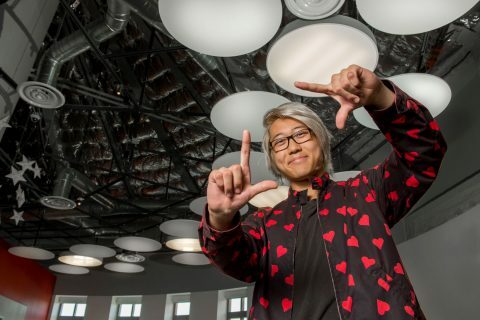 The augmented reality company Mira — started by three academy grads — is the first of many expected startups to come out of The Garage, a 9,000-square-foot studio on the fourth floor of the Ronald Tutor Campus Center. Academy students will have even more space to expand their creative visions with the opening of USC Iovine and Young Hall next year. Gathering in a maker space like The Garage is more than just sitting around a common area table, piecing together a group project. These dedicated communal spaces are designed to facilitate creativity, experimentation and collaboration as team members build physical and digital projects. Having a diverse and engaged community is key, as is offering the right tools for exploration. Prosthetic hands created with a 3D printer, carbon fiber bowties and an ice pack for postpartum recovery are just a few of the innovations from Blackstone LaunchPad USC, housed at the USC Marshall School of Business. Director James Bottom ’04, MBA ’14 knows enterprising creators often need a push to turn an idea into reality, so his challenge is this: Build your idea with $20. No “buts,” just make it happen. Their abilities grow more quickly as they learn from not just their own successes and failures but those of their peers, as well. At the Baum Family Maker Space in the Science and Engineering Library, USC Viterbi School of Engineering students will have access to a machine shop, 3D printer, wet lab and paint booth, as well as every tool young innovators might need to build prototypes and conduct experiments. It also brings many of the school’s competition teams under one roof — who knows what will happen when students who are building solar-powered cars, rockets and race cars converge? Elsewhere on campus, the USC School of Dramatic Arts and the USC School of Cinematic Arts house machine shops to fashion props and scenery for student productions, and the USC School of Architecture has its own “fab lab” — a fabrication space — to build models. The USC Roski School of Art and Design’s makerspace will open in its new studio facility in downtown L.A. for its first MFA in Design program students. And at the John D. O’Brien Nanofabrication Laboratory at the USC Michelson Center for Convergent Bioscience, the next generation of tiny medical devices and implantable prototypes — all the size of a DNA strand or a virus — may soon emerge. Think of it as a machine shop for nanotechnologies, says Andrea Armani, who holds the Ray Irani Chair in Engineering and Materials Science. But no matter which space or tools USC students use, it’s what they bring as a community — diverse skills, ideas and points of view — that turns an ordinary makerspace into one with unlimited potential. USC Iovine and Young Academy team ponders a tough question: How do you counter online radicalization? The cutting-edge academy, which combines design, engineering and art skills, will see its first cohort graduate next month.